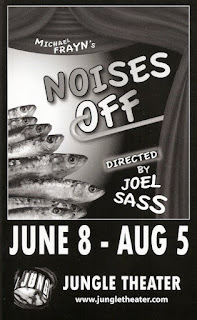 I've seen a lot of ridiculous shows lately (and I mean that in a good way) - Xanadu, Absolute Turkey, The War Within/All's Fair - and the Jungle Theater's Noises Off is another one. Not only is it a show within a show, it's a farce within a farce. Featuring a spectacular cast of favorites, intricately choreographed chaos, and over-the-top backstage drama, it makes for a very entertaining night at the theater. Noises Off was written by English playwright Michael Frayn after watching one of his plays from backstage: "It was funnier from behind than in front and I thought that one day I must write a farce from behind." 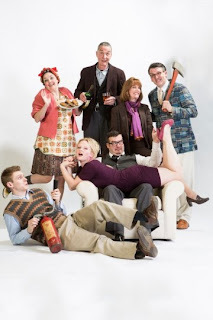 Six actors, one director, and two stagehands are putting on the fictional farce Nothing On. Act I shows us their final dress rehearsal, with the director watching from various parts of the audience. Act II is one month later, and the stage is turned around so that we get to see everything that happens backstage, while still hearing and catching glimpses of the onstage performance. It's a wild ride, and impossible to keep track of everything that's happening. Affairs, misunderstandings, drunkenness, tempter tantrums, and that's just backstage! Finally, in Act III the stage is turned around again and we get to see the performance, which has fallen apart. It's disastrous, painful, and hilarious. I've never seen a playbill that has a second, fictional, playbill within it. We get to read about the cast of Nothing On, complete with bios. This fictional cast is temperamental, difficult, and possessing questionable levels of talent. Fortunately the real cast is nothing like them; they're all brilliant in their portrayal of these quirky characters. (Although to be fair, we don't know what's going on in the real backstage of the Jungle; I imagine that would be quite entertaining as well, but hopefully with less violence.) Cheryl Willis is the veteran actress and star of Nothing On, who mixes up her lines and has jealous affairs with her fellow actors. Ryan Nelson (a fave from Yellow Tree) is the actor who can't complete a sentence that's not written for him. Summer Hagen is the flighty blond whose exaggerated performance is exactly the same every time, even if everything around her changes and it no longer makes sense. The divine Bradley Greenwald, who has a seriously killer singing voice but who is equally good at playing silly, is the simple man who needs a motivation for everything his character does. Add to that the very funny E.J. Subkoviak as the exasperated director, the nimble Kimberly Richardson as the awkward stagehand, Neal Skoy as the other awkward and overworked stagehand, Stephen D'Ambrose as the revered and famous actor who's also a drunk, and last but not least, Kirby Bennett (whose Girl Friday Productions is producing a Tennessee Williams play I've never seen, Camino Real, next year), and you have one dynamite cast. Directing all this craziness is Joel Sass, who also designed the reversible set, both difficult tasks beautifully done! If you've never visited the cozy Jungle Theater in the Lyndale/Lake area of Minneapolis, this is a good time to start. I've really enjoyed their season so far, and it looks like it's only going to get better with Waiting for Godot starring Nathan Keepers and Jim Lichtsheidl, and In the Next Room with a fabulous cast of women (and a few men). But don't wait for those shows, Noises Off is a very funny farce with a talented cast. Even though it's three acts long, you won't have any trouble staying awake for it with all the craziness going on in this fictional theater world. I've never thought about what actors do between their exits and entrances, but now I'll be imagining all kinds of crazy backstage shenanigans!